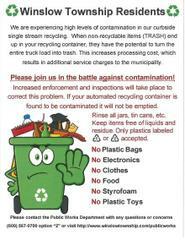 We are experiencing high levels of contamination in our curbside single stream recycling. When non-recyclable items (trash) end up in your recycling container, they have the potential to turn the entire truck load into trash. This increases processing cost, which results in additional service charges to the municipality. Follow link for more information.